First of all, both companies are offering discounts and/or free rides to voting booths, so please don’t let transportation stop you from hitting the polls! Second of all, after you vote, the Urban Events Global take on it is simple; pick the cheapest one for your trip (just get to the airport and let’s go!) We’ve added a code that will help you save up to $10 by downloading here! We hope this helps save a little! At Lyft, we’re working to improve lives by connecting people and their communities through the world’s best transportation. This Election Day (Tuesday, Nov. 6), we want to help people across America exercise their right to vote. Across the country, we’ll give away 50% off promo codes with our partners that encourage voter turnout. We’re thrilled to be working with Vote.org, Nonprofit Vote, TurboVote and more to help distribute codes to those who need them. We’ll also have a product integration to help passengers find their polling location. For underserved communities, we’ll provide rides free of cost through nonpartisan, nonprofit partners, including Voto Latino, local Urban League affiliates, and the National Federation of the Blind. Your voice is important! We’re excited to help make it heard in this year’s elections. Lyft promo codes and free rides are offered in accordance with all applicable laws and regulations, subject to Lyft’s terms and conditions, and is not intended to induce, nor is it conditioned on, the act of voting or voting for or against any particular candidate or measure. With the 2018 elections around the corner, many organizations and companies across the country are going the extra mile to support our democratic process. At Uber, we want to do our part, too—by helping voters register and get to the polls on Election Day. 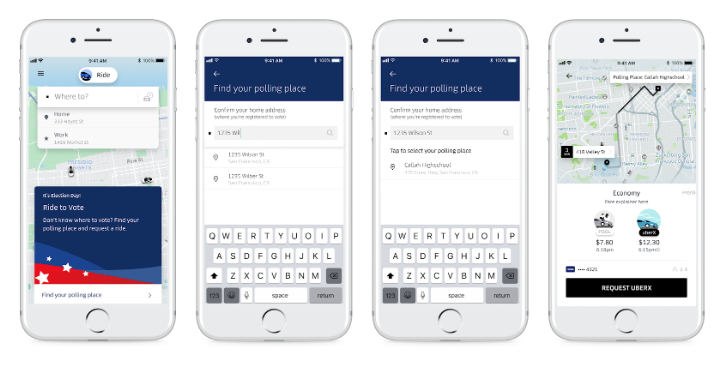 Using our technology and resources, we can help make it easier for every Uber rider in the U.S. to get to their polling place at the push of a button. We’re also partnering with nonprofit organizations to register voters before state deadlines and provide free rides to the polls on November 6. Free Rides to the Polls: To help the millions of Americans who cite transportation barriers as the reason they don’t vote, we’ll be partnering with #VoteTogether and Democracy Works to provide free rides to the polls. 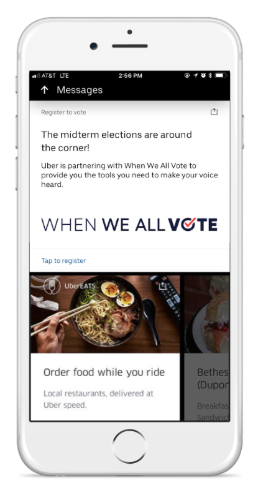 Helping Riders and Drivers Register to Vote: To help support voter registration efforts, Uber has partnered with When We All Vote to provide our customers with easy-to-use voter registration tools. Earlier this week, we began sharing registration resources with riders through the Uber app. We will also be emailing information about how to register to vote to drivers and delivery partners across the United States. And between now and Election Day, we’ll be hosting voter registration drives at more than 125 U.S. Greenlight Hub locations around the country to help register as many eligible voters as possible before their state’s deadline. These driver support centers will have local registration resources on hand, so drivers and delivery partners—or anyone else who wants to—can come easily register to vote in person. Find a Greenlight Hub near you at uber.com/drive. Uber for Campaigns: Any campaign or organization can use our existing Uber for Business offering to purchase and distribute promo codes for rides to the polls on Election Day. More information is available atuber.com/business. Decisions get made by those who show up. This Election Day, Uber will be doing what we can to make it easier for people to do just that. On November 6, I hope everyone does one thing: vote! Any promo codes or free rides under the Uber Drives the Vote program are offered to individuals by our partner organizations and in accordance with all applicable laws and regulations, subject to Uber’s terms and conditions. Any such offer is not intended to induce, nor is it conditioned on, the act of voting, refraining from voting or voting for or against any particular candidate, political party or measure.